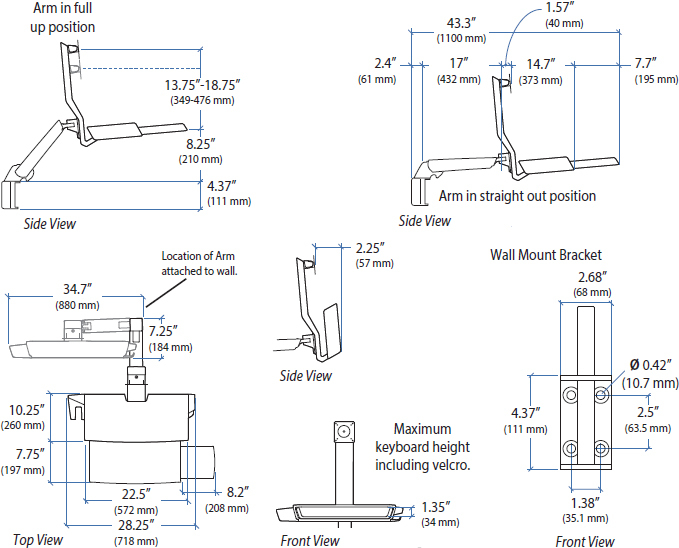 25" monitor height adjustment: Monitor adjusts 25" vertically, keyboard adjusts 20"
Durable polished aluminum construction. Ergotron 45-260-026 also features a worksurface with pull-out keyboard tray, which facilitates caregiver workflow. Ergotron 45-260-026 holds a monitor, bar-code scanner, keyboard, wrist rest and mouse on the same arm, providing easy, single-motion height adjustment. But most importantly it allows you to sit or stand comfortably while working with the arm’s ergonomic 25" (64 cm) LCD height adjustment range. A unique cable management system conceals and organizes cords, making cleaning easy. Workspace not sturdy enough to type and not wobble. Works great to adjust monitors alone though.